Epiphone presents the new Ltd. Ed. EJ-160E Acoustic/Electric, one of rock n’ roll’s most revered guitar designs now featuring a Solid Spruce top with an Epiphone Stacked P-100™ pickup and available in two beautiful color finishes—Natural and Vintage Sunburst. The original “J-160E” was one of the first acoustic/electric guitars on the market when it was released in 1954. Over the decades, the “J-160E” has been embraced by a wide range of artists both classic and contemporary like Lightin’ Hopkins, Elvis Costello, Paul Weller, and of course John Lennon. In fact, the “J-160” acoustic/electric was the only guitar to appear on every Beatles album from Please Please Me through Abbey Road. Now with the new Ltd. Ed. EJ-160E Acoustic/Electric, the “House of Stathopoulo” brings this vintage and hard-to-find classic into the 21st century with a Solid Spruce top for a limited time and only through select Epiphone Dealers. Just like the original, the new Epiphone Ltd. Ed. EJ-160E follows the contours of the industry standard “Southern Jumbo” acoustic and features a Solid Spruce top with a Select Mahogany body. 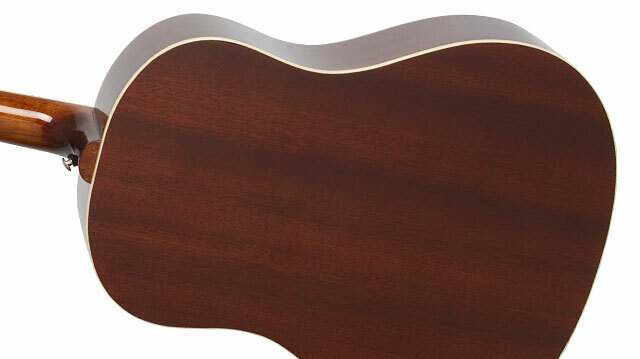 Solid Spruce is the “top” of choice for premier acoustic guitars. The more you play your EJ-160E, the more open and expressive the tone—so play your EJ-160E a lot! The body top has 5-ply Ivory/Black binding while the Select Mahogany back has single ply Ivory binding. The pickguard is imitation tortoise with the 60s era "E" metal logo. 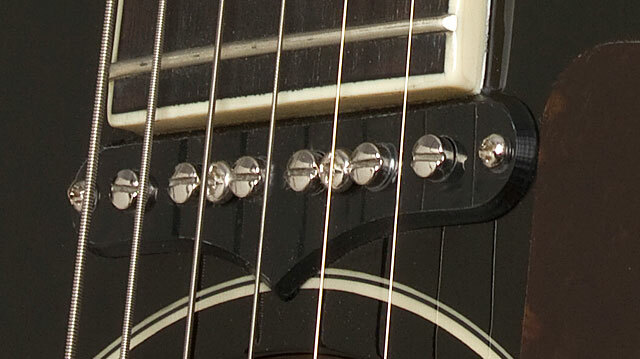 The EJ-160E’s bridge has the reverse belly design familiar to "J-160E" collectors and features a compensated bone saddle. The Select Mahogany neck has a comfortable “1960s” SlimTaper™ D-profile and is glued to the body using a Dovetail joint. The neck has a 24.75” scale with vintage style pearloid “Trapezoid” inlays just like the original models. The fingerboard has single ply Ivory color binding and features a 12” fingerboard radius, 20 medium frets, and a bone nut along with the Epiphone classic Sloped Dovewing headstock. What made the original J-160E so renown was its unique pickup system and to bring that sound back to life for the 21st century, the new Epiphone Ltd. Ed. EJ-160E features an Epiphone Stacked P-100™ humbucking pickup at the end of fingerboard. The Epiphone Stacked P-100™ pickup is seated discreetly between the end of the guitar's fretboard and the sound hole. 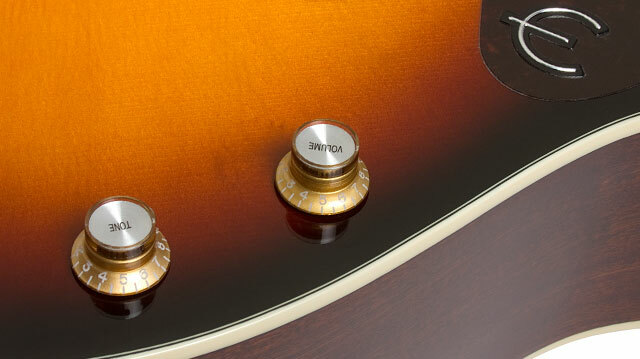 Master Volume and Tone controls feature Top Hat knobs with metal inserts and pointers--just like vintage models--and are located on the guitar's lower bout. And each volume and tone control use full-size 500K potentiometers. All hardware like the Epiphone "Deluxe" machine heads with a pro 18:1 tuning ratio, the Epiphone Heavy Duty ¼” output jack, and pre-installed strapbuttons are made from solid nickel and the Ltd. Ed. EJ-160E is set up and tuned at the factory using Epiphone 12-53 nickel strings. An optional hardcase is also available.